If you run Selector SQL, you may only send your data to other users of Selector SQL. If you also have Linker, the recipient does not also need to have Linker, but they will not have access to the Linker data. Your recipient will also need permission to license the database Call Letters you send them. Be sure to arrange this in advance. To send data, open RCS Menu and click Tools. Select the database to send so it is highlighted on the list. At minimum, fill in your Name, the Station or Company where you work and your Email address in the appropriate fields. Click OK. 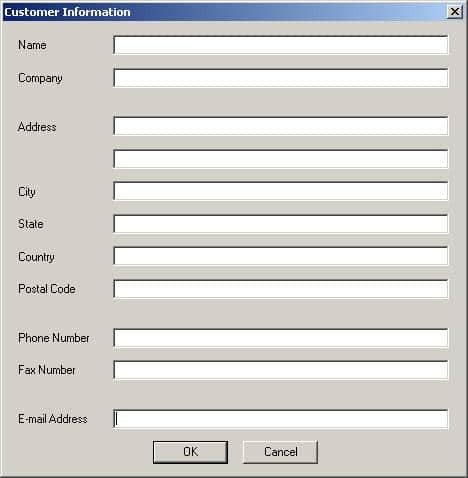 This screen no longer will appear during Data Exchange, but if you want to change anything later you can choose Help, then Customer Information from RCS Menu. RCS User ID: your RCS UserID goes here. In some cases this is the same as your email address. This value comes from the Email Address field on the Customer Information window (on the Help menu). If it is incorrect, open the Customer Information window to change it.RCS Password: type your RCS password in this box.Get One Now button: If your email address is on file at RCS, click this button to go to the RCS web site to request a User ID and Password via email.To: Put the email address of the person to whom you are sending the data. The data is not emailed to them, but a notification to pick up the database is sent when the data has been fully uploaded. The email address used here can be anyone’s email address, but only people who have Selector will be able to use the data you send them. If you wish to specify more than one recipient, put in multiple email addresses in this box with a comma separating each one. 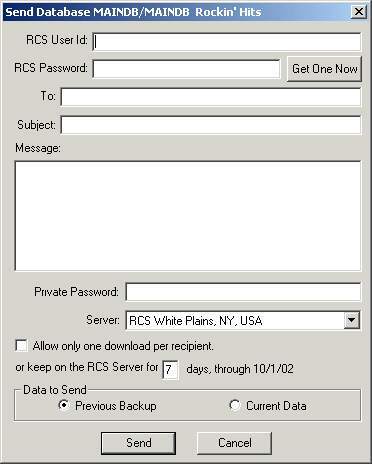 To send the data to RCS Support in New York, enter support@rcsworks.com. Allow only one download per recipient: This control is no longer used. Data to Send: In this box you indicate whether you wish to send a previous data backup or send the current database. If sending a previous backup, a pick list of available backups appears when you send. If you choose the current database, a fresh backup will be taken during the Send operation. Click the Send button to send the data. The software will display the progress of sending the data to RCS. Depending on your internet connection speed this will take several seconds to several minutes. The message “Data sent successfully” appears when the transfer is complete. When your database is available on the RCS Server, an email message is sent out to each Recipient email address you specified. Depending on how busy the RCS Data Exchange server is, this may take several minutes before the email notifications are sent. You may log in to the RCS web site to manage the Data Exchange databases you have sent using the My Data Exchange page. This page shows you the available databases, which ones have been downloaded and the Pickup IDs. It also shows any Databases that have been sent to you. Open RCS Menu and select Tools. In the Data Exchange ID box, type in the Data Exchange ID from the e-mail. TIP: If the e-mail message is available on the same computer as that running Extender, open the e-mail and highlight the Data Exchange ID value only, then Copy the data using Ctrl-C (or Edit|Copy), then click inside the Data Exchange box and Paste using Ctrl-V. This process eliminates the chance you may enter the number incorrectly. In the Destination Database box, select whether to create a new database on your machine (Create New) to contain the data being sent to you, or if you wish to overwrite an existing database (and which database to overwrite). If creating a new database, you should name the folder to contain the new database.